The City of Lake Oswego is hosting an emergency preparedness fair on April 24th, a Wednesday. It will be held from 5:30-7:30 pm at the Lake Oswego Maintenance Center (17601 Pilkington Rd). We have no idea what sort of emergencies lay in our future. It is now well known that the Pacific Northwest has a history of huge earthquakes that on average occur every couple of hundred years and that we are now about 200 years since the last one occurred. Other potential events are flooding (that happened in 1996), severe storms, and fires. Being prepared is pretty important. 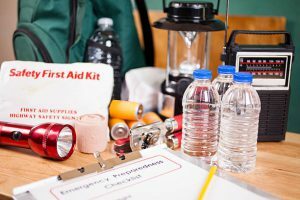 The emergency preparedness fair is going to feature about 20 booths sharing information on putting together your own preparedness kit that will address the need for supplies, food, water storage, pets, sanitation, and even CPR training. Water is a particular concern as it is estimated that each person and pet in a household needs a gallon of water per day and that we should plan for a 14 day supply. At the preparedness fair the city will be giving out 300, 3-gallon water containers that can be used to collect water from distribution centers that, in the event of an emergency, will be set up by the city. This sounds like a wonderful event that is free and worthwhile. See you there! Lake Oswego’s Own ‘La Provence’!